After nearly three years and multiple delays, Techland announced this week that it has stopped work on Hellraid. A dark fantasy action title which was to feature a first-person perspective and cooperative multiplayer, the project has been shelved following an internal analysis which determined the game is not meeting expectations. 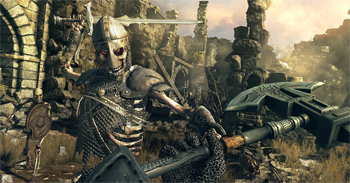 First announced in 2012 (then codenamed "Project Hell"), Hellraid was planned to release in 2013 for PC, PlayStation 3 and Xbox 360. Still unfinished in 2014, Techland pushed Hellraid back further to rebuild it on the developer's newer Chrome Engine 6, dropping the PS3 and Xbox 360 versions in favor of releases for PlayStation 4 and Xbox One consoles. Meanwhile, the scope of the game continued to grow and a Steam Early Access beta was subsequently canceled that November, as it was felt the changes made Hellraid unsuitable for the system. At that point, regular updates to the title's development blog ceased until this week's announcement. While the door has seemingly been left open for Techland to return to Hellraid in the future, going forward the company will be consolidating development resources to provide additional support in expanding the Dying Light franchise.